From now on live into the future with V-Guard DU 10000. Do more with its wide array of features embedded into this gigantic power horse that’s so easy to start and is completely generator compatible to the hilt. The good news! Its output form is sine wave, with a host of protection features like short circuit, power overload, battery deep discharge, battery overcharge, main low, main high and thermal protection. Compact in size big in performance V-Guard DU 10000 retains its image of being the fastest when it comes to scale the number of machines to be connected with soft start feature. It never lets you take a U-turn in the middle of a business operation as V-Guard DU 10000 has quick battery charging capacity that ensure the device is fully ready all the time to replenish multi-devices during power cuts or while long haul working hours. V-Guard DU 10000 is a flexible device that adjusts the backup time in line with the load connected as desired. 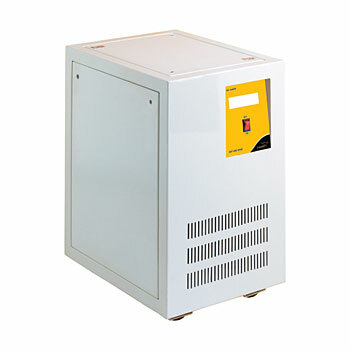 It operates under 0 to 45 degree Celsius temperatures without any trouble.